Breakfast at Oakwood & saw Hugh off at station. Worked all day at zoo book. Met Hugh at 7. Had dinner together & then evening indoors at 34. 'Oakwood' means the guesthouse that Hugh was staying in on Oakwood Avenue. '34' means 34 Oakwood Avenue. So although Hugh had to go in to London to work, they were together at breakfast and in the evening. The log tells us that Enid wrote a 3000-word chapter 'How Animals are caught', which would be chapter two in the Zoo Book. Breakfast at Oakwood with Hugh. I was tired all a.m. & read zoo books till one. After lunch I met Phil & we did some lovely shopping. Home with Hugh at 6.40. I showed him my trousseau things after dinner and he loved them. Phil: "I thought you were going on holiday?" Enid: "I am, and I'm taking my Window with me. Just got to finish off this damned Zoo Book for Hugh." Phil: "Then you can make out like rabbits on the downs." Enid: "More like hermit crabs on the beach." Finished zoo book!! Breakfast at Oakwood. Worked all day. Rushed up to town to get a blue pullover for Hugh. Met him & came home with him. Played draughts in evening & I felt very tired & Hugh teased until he stopped & was nice. Or put it another way: chapter 3, 1, 15, 2, 16. Does that make sense? Not to me, sitting here in The Land of Great Stupids! Packed etc all a.m. Up to town to see Perry at 5 & he gave me an order for a story. Met Hugh at 6 at Victoria & we went to Felpham together. We went out on sands with Mabel & walked to Bognor till 10.30. Ah, so the mention of Felpham now makes sense. The Attenborough household (I presume, though other friends may have been involved, as well or instead) had gone on summer holiday to West Sussex on June 28. Enid and Hugh now joined them. I wonder to what extent they took advantage of having number 34 to themselves for a few evenings and nights? If indeed they did have it to themselves. On beach all a.m. with Hugh & he was a dear. In hay field all afternoon & played tennis till supper. Hugh is upset because a man is coming here next week to our boarding home. After supper we went on beach & I told Hugh he was beastly to me at tennis. He was cross with me about it & about everything & all today has been spoilt. I did try to be decent about things but Hugh is so overbearing & he just overrules everything I say. Poor old darling son. Enid gives the impression of being reasonable. I like the way she criticises Hugh's overbearingness, and then, because she loves him, makes herself feel more positively towards him. A miserable day. On beach all a.m. & in hayfield all afternoon. On beach till supper & we quarrelled hard till we began to laugh; & I gave in over everything & then Hugh was sweet. We went out after supper & he was so dear to me again. But I’m to stay after all. Enid gives in. But then Hugh lets her have her way. So who has won? That is, if it’s right to talk of winning and losing in such situations. There are danger signals concerning this relationship. But clearly Enid is going along with the flaws in Hugh's character. Why? Again, because she loves him. I walked over to Bognor with Hugh & he just missed the 8.10. I saw him off at 8.30. I hated him going & I’ve missed him all day. I stayed in & worked all a.m. & went in hayfield till supper. Bridge till bed. The new man is engaged & is a softie, so all our quarrel was needless. The new man is a 'softie' - what an outdated expression! And it just shows how such a male perspective – hard being better than soft – had made its way into everybody’s psyche in those days, even a fair-minded, kind-hearted woman like Enid, who loved life in all its natural variety. According to her work log, Enid wrote a Talk on this day. 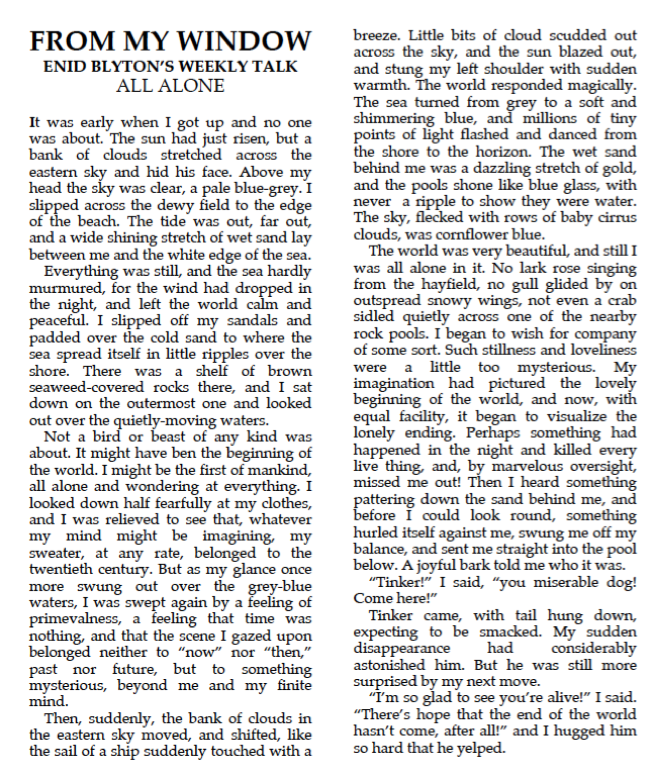 I wonder if Enid wrote this piece - another paean to solitude- while lying in her nest. I like to think she did. And what is it saying? If her most beloved spaces are taken away (by marriage? ), then she will still be able to make her bed and lie on it! 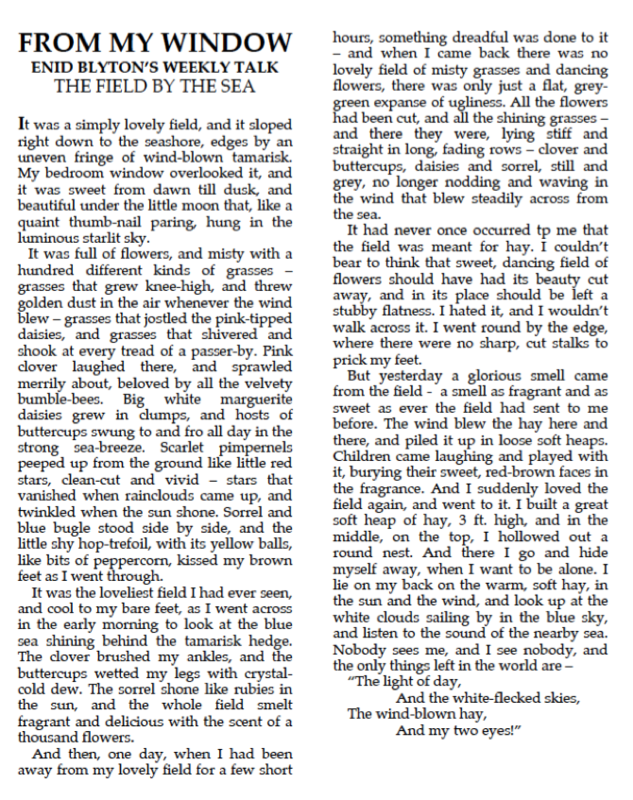 Wrote letters all a.m. Slept & read till tea & read till supper, out in the hayfield. Bridge till bed. It is so lonely without Hugh. But I had a letter this a.m. from him. And £63 from Nelson. That may be payment for those first six 'readers'. On beach with Mums all a.m. writing letters & reading. In hayfield till tea, writing to Hugh & sleeping! 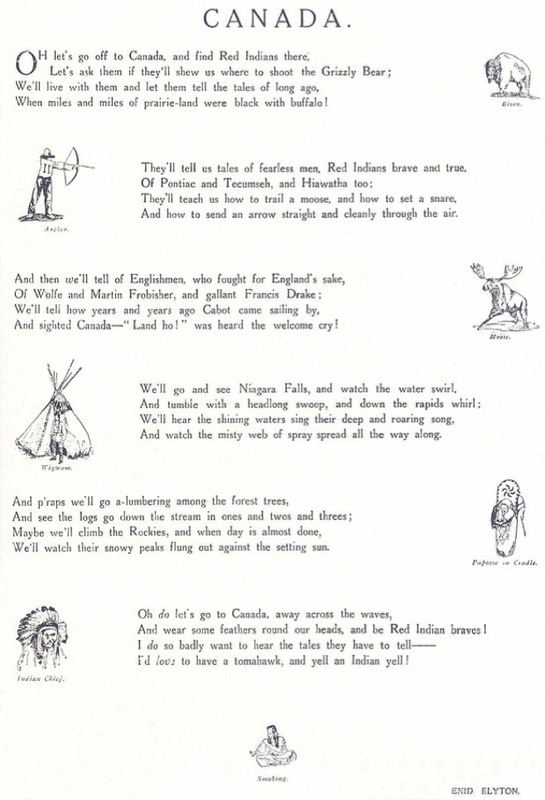 Wrote 'Canada' poem there afterwards & finished it after supper. Bridge till bed. I take this to mean that Enid was lying in her nest of hay when she wrote to Hugh. And then again when she wrote ’Canada’. And watch the misty web of spray spread all the way along." Yes, that's the way to travel. Feeling so comfortable where you are, that your mind can travel anywhere at will! Wrote & read all morning by myself. Mums & I caught buses to Slindon Woods this afternoon. It was a lovely place & we got some lovely wild flowers. Back at 7.45. Read till bed. Enid's log book suggests she wrote two of her Talks in the morning. But as her diary states she wrote on Friday as well, yet she's recorded nothing in the log for that day, I'm going to assume that she wrote one Talk each day. Greyears the rabbit crops up a couple of the stories in The Enid Blyton Book of Fairies. 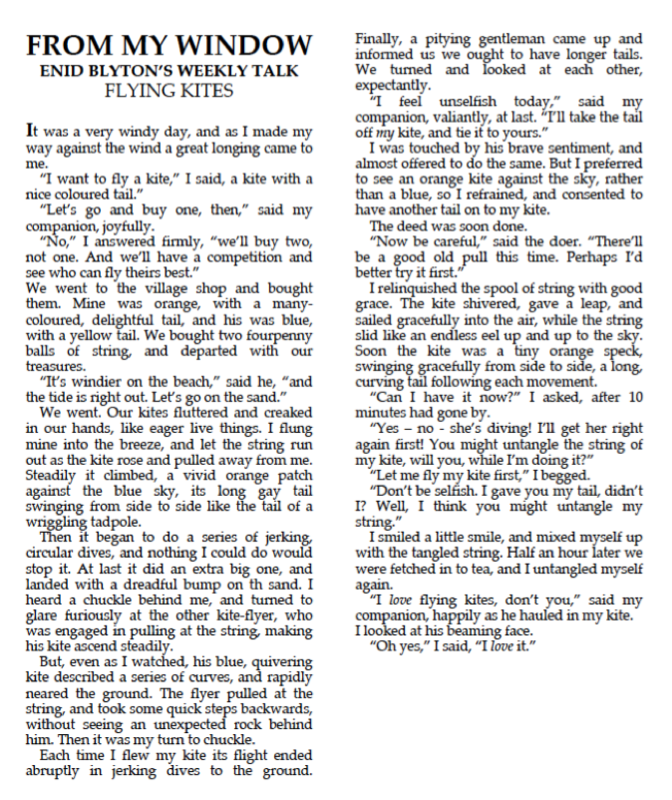 On Thursday, shortly after this was written, Enid mentions taking buses to Sindon Woods. 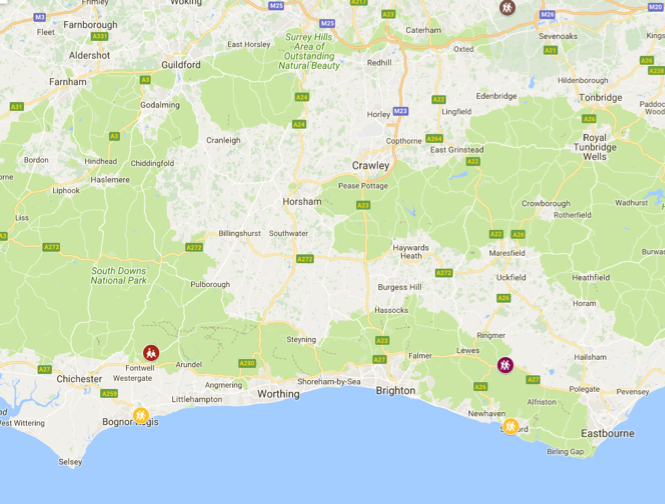 I've marked Sindon Woods on the map below, but also Firle Woods, which is mentioned twice in the Talk. Firle Woods is much closer to Seaford, where Enid had been on holiday earlier in the year. It sounds as if Enid has long been familiar with Firle Woods, perhaps it was somewhere her father introduced her too. After all, it would have been easy enough to get to from Beckenham, using the railway. Anyway, perhaps she went to Sindon Woods with Mums after writing about Firle Woods and Pamela. That could almost be a Blyton sentence. But Enid Blyton and Virginia Woolf are thought of very differently. The first has been dismissed by critics as merely a writer for children, while the second, deemed a significant modernist, has attracted any number of academic studies. Not fair, says I: both women were hugely talented. But it's true that Virginia Woolf, author of A Room of One's Own, which one would have thought to be an essay made for Enid, doesn't seem to have been on her radar. Why not? I suppose because Enid didn't study English at University, instead she trained to be a teacher. The dominant intellectual influence on her life was her father, and he came into maturity long before modernism. When Enid’s father left the family when Enid was about to turn thirteen - having educated, stimulated and enchanted his daughter - it's almost as if Enid embarked there and then on a project of writing to educate, stimulate and enchant other children. And she never looked back. Or around. In April of 1925, Enid commented in her Teachers World column, ‘A Queer Fashion’, that most of the new novels ended up on her desk, sooner or later, and that she read them. She thought many of them were needlessly miserable. I wonder if that was her conclusion when Mrs Dalloway was published a month later. One of Woolf’s main characters in that novel succumbs to suicidal depression as a result of the impact of World War One. Enid never really seemed to take that catastrophe on board, perhaps as the start of it came just four years after the personal catastrophe of her father disappearing from her life. Worked all day mostly. Met Hugh at Bognor at 8. I was ever so glad to see him. We sat on beach & talked all evening. At least, after 10.15. Hugh was disappointed because I wasn’t much in love, poor old boy. Clearly Hugh had been at work all week on the Newnes coalface, but was now free to rejoin the party on the coast. As I mention above, I'm assuming the Talk below was written on Friday morning, before meeting up again with Hugh. Gosh, not just a beloved field gone this time, but all life on the planet! The piece shows Enid imagining herself to be absolutely alone. Why? Because, in fact, she was about to get hitched to another person and she had to prove to herself, deep down, that this was what she really wanted. She had been very happy, on her own. In order to carry on being happy, did she need a partner? She thought so. She had thought long and hard about it, and it seemed so. Could she be talking about Hugh at the end of the piece? Is this another of those Hugh metaphors? After all, it’s essentially him that Enid is going to share life with from August onwards. A horrid day. I wasn’t in love with Hugh & I was very worried about last week’s quarrel. We were on beach all a.m. & flew kites in afternoon. On beach all evening & we talked. Hugh was a dear. The kite-flying gave rise to another Talk, as we'll soon see. A gloriously hot day. Bathed in morning with Hugh & it was lovely. We sat in a field all afternoon then went & had tea. Then we sat in another field till supper. On beach in the moonlight till bed. A lovely day. Caught 8.10 from Bognor with Hugh & arrived in London at 11. I went to see a ripping flat at Chelsea & perhaps we’ll have it. Lunched with Hugh at Soho & went back to Beckenham. Met Hugh at 7 & spent evening with him. Worked all day. Met Hugh at 7 & we had a lovely evening on the verandah. The moon was full, it was lovely. He was a perfect darling & I love him. Yes, back to work after a ten-day summer holiday. For the rest of the month, apart from writing a couple more Talks, she would be writing the second batch of Nelson Readers. This day she wrote,'The Princess and the Pea' and 'The Tinder Box', about which more very soon. To lunch & tea at Heathfield. Met Hugh at 7 & we had dinner at Oakwood. & spent evening on the verandah at Rosslyn. Two more stories, 'LIttle Claus and Big Claus' and 'The Emperor's New Suit'. A little research has revealed that these stories are retellings of Hans Christian Andersen. The four stories written on July 14 and 16 add up to about 8,500 words, which was the length of A Book of Silly People and Old English Stories Retold. The book's existence goes unacknowledged in the Enid Blyton Society's Cave of Books, so I let Tony Summerfield know about the following page from the front of one of the second batch of Nelson Readers. I await his response. Messed about & read all a.m. Washed my hair in afternoon & Daisy came to see me. After tea I changed into evening dress & met Hugh at 7 & we went to dinner at Lyvers & to see “Toni” after & it was awfully funny. Home at 1.15! Wrote letters & worked till 12.30. To Heathfield to lunch. Met Phil at 3 & we did some lovely shopping. Home at 8 & had dinner alone at Oakwood as Hugh had to go out. Tried on new things till bed. Kissed Hugh goodnight at 12.15 when he came by. Enid wrote a Talk this Friday. Which made it four Weekly Talks from a ten-day holiday at the sea-side. Enid certainly did take her Window with her when she went on her summer hols, the Teachers World cartoonist had been uncannily accurate. It had been six days before, Saturday the 12th, when Enid and Hugh had actually flown kites together. A day that Enid described as being 'horrid'. And that's what's happening during the flying of the kites. Enid trying to be decent (and to fly her own kite), yet Hugh just overruling everything she says (and flying the kite himself). But at the end of the piece, when she sees his beaming face, Enid just forgives him. Only I'm not sure that she does. I suspect that the italics on the final 'love' suggest an irony. Enid's goodwill towards her husband-to-be is being sorely tested. And Enid came close to saying as much in public! After writing that Talk, Enid met Phil in town. Enid: "Oh, you should have seen him with that kite." Phil: "They're all just overgrown schoolboys. And I have to say, it'll be worse once you're married. Hugh will be being on his best behaviour now." Enid: "His best behaviour? I could have throttled him with the tail of the kite. My kite." Phil: "Calm down, darling! Recite to me a verse of that lovely Canadian poem you wrote on holiday." AND HOW TO FIRE AN ARROW STRAIGHT AND CLEANLY THROUGH THE AIR." Phil: "That seems to have cleared the air. Pardon the pun. Now let's go shopping." How ridiculous though: Hugh flying Enid’s kite. If ever anyone flew their own kite, it was Enid Blyton! I showed Hugh the things I bought yesterday. He loved them. Then up to town to see Chelsea flat. Lunch at Waterloo. To Hampton Court. Hired a punt. On river till 7 & then came back & had dinner at the Mitre. It was lovely. We had duck & green peas. Then on river again & saw the fireworks, it was such fun. Home by last train at 1.15. Another Talk came from the punt outing. But it wasn't written until the following Monday. A quiet day on verandah. We both slept from 2.15 to 5.15 & had to go without tea! Hugh was a darling & I loved today. I love when he is gentle & considerate. Yes, that's the bottom line, to be gentle and considerate to one's partner. And it's what Enid wished for: a consistently kind Hugh. Sunday, March 9: Enid and Hugh sat on verandah in sun till tea and Hugh told Enid what he had meant to tell her at Easter. Sunday, April 13: They sat on the verandah and Hugh told Enid about Africa. Sunday, May 11: They spent the afternoon talking there. Monday, June 23: They sat out on verandah till 11. Friday, June 27: They spent the evening on the verandah. Sunday, June 29: On verandah all evening. Monday. June 30: They sat on the verandah all evening. Tuesday, July 15: Spent the whole evening on the verandah. The Moon was lovely. Sunday, July 20: Quiet day on the verandah. They both slept all afternoon and missed tea. There are no photos, but I can see the verandah in my mind’s eye. With lovers. It’s a shame that Enid has left Hugh out of this one. After all he was in the boat with her and had shared the magic of the water. 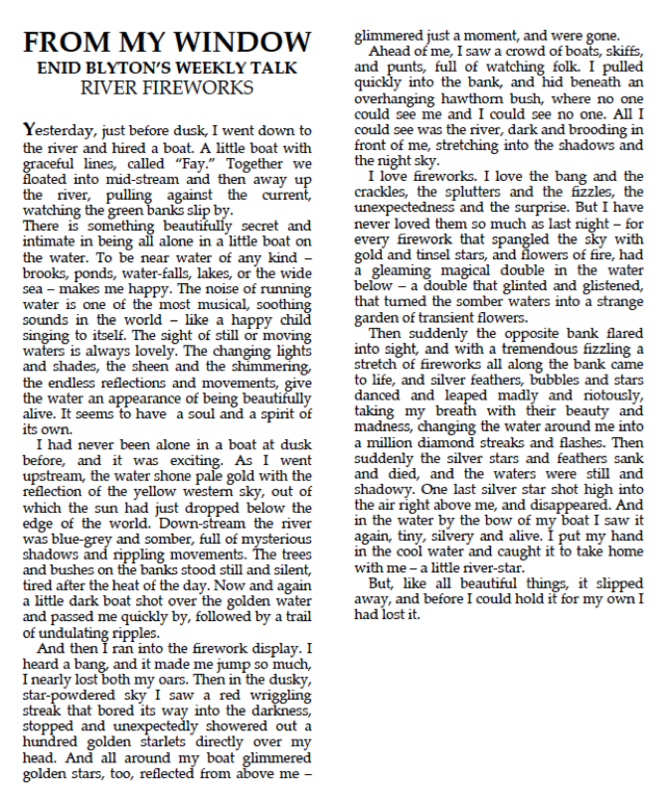 He’d shared the double magic of the fireworks and their reflection in the water. Enid is sitting in the boat with her lover. She is happy and she would like the happiness to last forever. But she knows it can’t last and won’t last. And so there we have it, a pang of anguish. As well as this exquisite piece, Enid wrote 600 words towards the zoo book. 'Kangaroos and Anteaters', Enid noted in her log. The kangaroo bit was added to 'Monarchs of the Wild', while the anteaters passage was added to the 'Armoured Animals' chapter. An edit asked for by Hugh, I expect. But I don't suppose he asked Enid for the revision on Saturday, when they were on the river together. It sounds as if they had a special time then, something they would remember all their lives. Blank diary. In the work log, Enid noted writing two stories. 'How Tsietse found his Father' and 'Little daughter of the Snow'. Blank diary. In her work log, Enid again noted writing two stories. 'Marya and the Baba Yaga' and 'The Tongue-Cut Sparrow'. The four stories make another 8,500 book for Nelson, this one called 'Tales from Other Lands'. Certainly, 'How Tsietse found his Father' is an African tale and 'Marya and the Baba Yarga' is Russian'. Those two stories appeared in a previous Nelson title, Fairy Tales from Far Away, written by Marie Bayne and published in 1912, so again the publisher, for some reason, is getting Enid Blyton to provide versions of stories that they're already familiar with. I think what she means here is Tarrydiddle Town and Other Stories and A Book of Little Plays. In the first case, Enid didn't have to write anything new, she just reused stories that had appeared in Merry Moments, the magazine and the annual. Tony Summerfield kindly replied to my email about the 'missing' Nelson books. 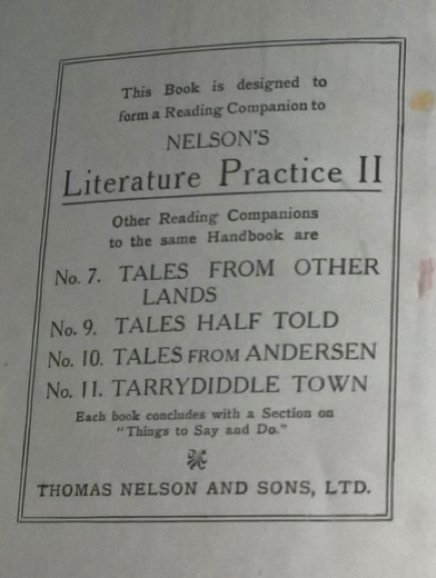 He has told me that, although Enid was paid for them, and although they appear on the preliminary page of A Book of Little Plays, Nelson did not publish Enid Blyton's Tales from Other Lands or Tales from Andersen. Tony has also cleared up something about the poetry commission. Although Nelson published Silver and Gold in 1925, there was a poetry Reader called Day by Day which they commissioned from Enid, paid her for, but did not get round to publishing. Perhaps there was a change of editor at Nelson, the Enid-eulogising Dr. Wilson taking a backward step. To satisfy my curiosity, I bought a copy of Stories from Hans Andersen, which has been 'Told to the children by Mary McGregor'. 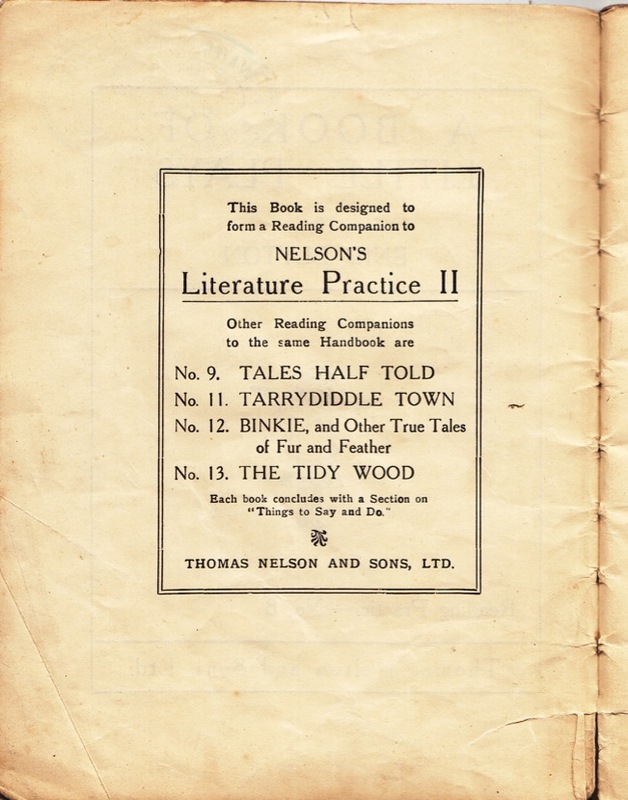 The contents page reveals that two of the six stories ('Big Claus and Little Claus' and 'The Tinder Box') were amongst the list of four that Enid rewrote. Why on earth would Nelson want two such similar books? Dr. Wilson would appear to have been wasting Enid's time and Nelson's money. As already mentioned, exactly the same goes for 'Tales from Other Lands', with its two-stories-out-of-four overlap with Fairy Tales from Far Away, written by Marie Bayne and published by Nelson. Odd. 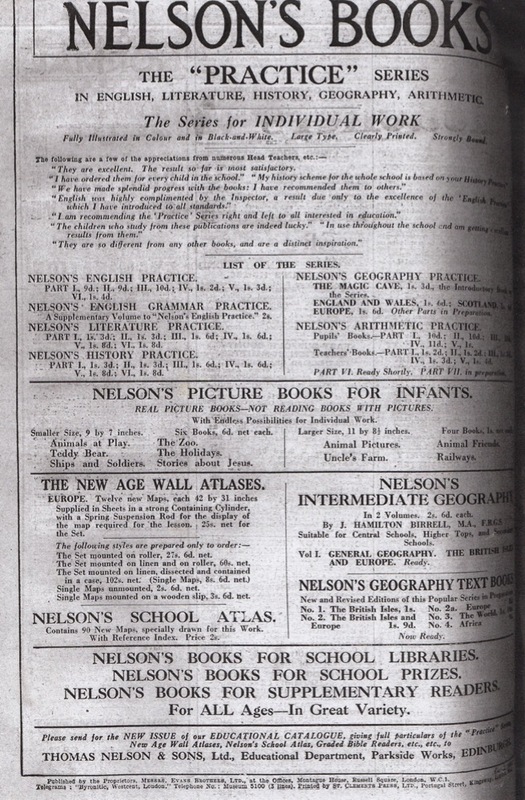 As this full-page ad taken in Teachers World shows, Nelson was a large publishing concern, specialising in educational books. No room for Enid in the whole page, though her books were still only in the pipeline when this advert was placed in November 1924. My own copy of A Book of Little Plays has turned up in the post, from Abebooks at a cost of £15. 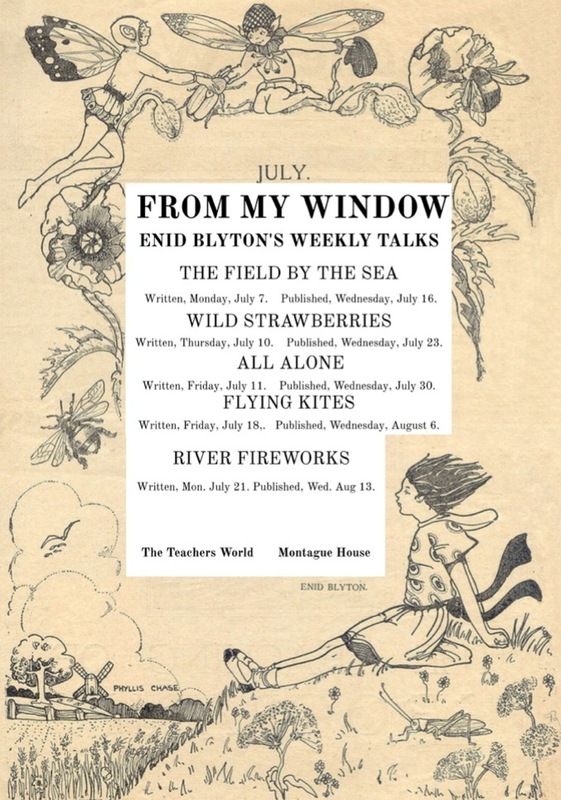 It's a reprint, and the preliminary page is different from the one shown in connection with Enid's diary entry on July 16, which was also from A Book of Little Plays. Titles number 7 and 10 are no longer mentioned. And titles number 12 and 13 are not by Enid Blyton, Tony Summerfield has assured me. Which further suggests that Nelson would seem to have lost faith in Dr. Wilson's pet project of releasing books only written or rewritten by Enid Blyton. Any writer knows that editors come and go, and, as they do so, publishing opportunities come and go as well. Diary blank. 'Sing a Song of Sixpence' written. Diary blank. Work log blank. Diary blank. Work log blank. So this particular weekend is lost to posterity. Shame, but look at the riches we have been handed down! Diary blank. But Enid is back at work, coming up with Tales Half Told for Nelson. 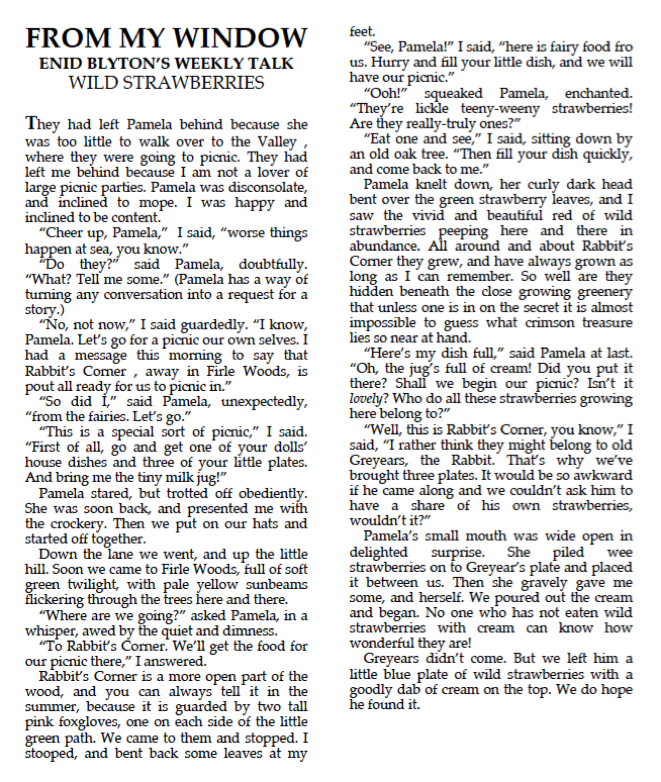 A repeat of the idea that she'd used in Teachers World in June, but with different stories. She started the book off with 'Three Bears' (1000 words) and 'Blue-Egg Magic', which Enid noted has two endings. So maybe these were stories told in full, to introduce the reader to the idea? Diary blank. Enid wrote a 3000-word story, which wasn't for Tales Half Told. Then she wrote three half-told tales of an average 500 words each. Diary blank. Enid spent the day writing Tales Half Told, another nine of them. The order in which she wrote the stories, 14 in all, is more or less the order in which they appear in the printed book. Yes, Nelson did publish this particular reader, Enid hadn't been abandoned by them. They published 5 out of 6, then 3 out of 5, of the books they commissioned from her in this series. She ties the knot in August! Be excited, Enid. Be very, very excited!